UK Prime Minister Tony Blair is set to meet Libyan President Colonel Gaddafi, it has emerged after "milestone" talks in London on Tuesday. The news came as Mohammed Abdulrahman Shalgam became the first Libyan foreign minister to visit London since 1969. Foreign Secretary Jack Straw said they had agreed to enhance cooperation on finding Wpc Yvonne Fletcher's killers. She was shot in 1984 outside the Libyan Embassy in London. The incident led the UK to break off diplomatic links. At a news conference with Mr Shalgam, Mr Straw called his visit "tangible proof" of improving relations between Libya and Britain. 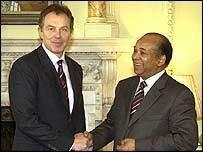 Mr Blair himself hoped to meet Colonel Gaddafi "as soon as convenient" - although a date had yet to be fixed, he said. Meanwhile, the Reuters news agency is quoting American and Libyan officials in London as saying Washington is re-establishing a diplomatic presence in Tripoli. Mr Straw said "good progress" was being made on implementing the December agreement on Libya's weapons of mass destruction programmes, said Mr Straw. He hoped the relatives of those killed in incidents like the Lockerbie bombing and Wpc Fletcher's murder would understand it was "in everybody's interest" for normal relations to resume with Libya. Asked about the police officer's murder, Mr Shalgam said his country was willing to discuss "any file". 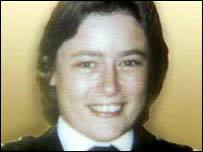 Libya accepted "general responsibility" for Wpc Fletcher's killing in 1999 and agreed to pay compensation to her family. Mr Shalgam denied Libya had made any concessions in December's weapons announcement. While Libya had the know-how, it had not planned to make weapons of mass destruction, he said. But he acknowledged there had been differences between the UK and Libya in the past. He added: "Things have changed. We have the courage to review our politics and directions. The caravan is moving on." The Foreign Office has described Tuesday's talks as a "milestone in what have been steadily improving relations" between Libya and the UK. It is also part of a wider plan to bring Libya into the "international mainstream". "The big question is whether the US invasion of Iraq pushed Colonel Gaddafi into this new relationship with the West"
It is the first contact at cabinet level since Britain restored diplomatic relations in 1999. That was the year the two Libyans accused of the 1988 Lockerbie bombing were handed over for trial. The UK ambassador to Libya at the time of Wpc Fletcher's murder said Tuesday's talks did not appear to bring anything new about the case. Oliver Miles told BBC News 24 that help with investigating the case had been on the agenda since relations were restored but it was really a police, not a government, issue. "It's a very difficult case and I'm not at all sure that I can see what closure there will be," he added. Meanwhile, Italian Prime Minister Silvio Berlusconi is on Tuesday meeting Colonel Gaddafi as he becomes the first major western leader to visit Libya since its weapons announcement. Former UK foreign secretary Geoffrey Howe welcomed the improvement in relations with Libya. "Engagement in cautious careful steps is the best way of handling relations with any country," he told The World Today on BBC World Service radio. Former US assistant defence secretary Frank Gaffney, of the right-wing Centre for Security Policy told BBC Radio 4's Today programme it would be good if Colonel Gaddafi gave up his weapons programmes. But he added: "My fear is if he is allowed to remain in power, if he is allowed to garner even more resources from the West - financial as well as technological - he could pose a considerably more serious threat to all of us down the line." Libya was listed by the US as a sponsor of terrorism and was the target of Lockerbie-related UN sanctions until 2003.